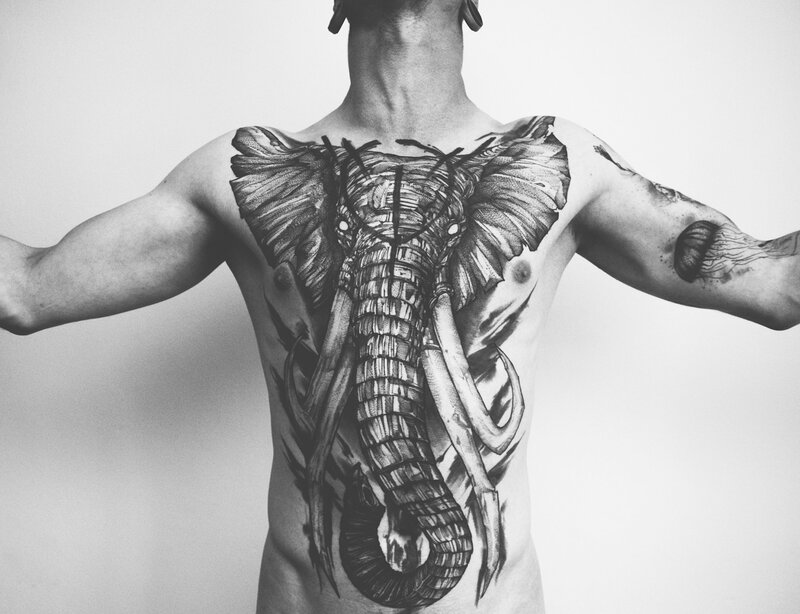 Tattoos, like fine art, offer another way in which to express ourselves through visual imagery. The line, especially, has had a long history—prehistoric, in fact. Evidence of its existence first appeared in cave drawings in Southeast Asia, and according to researchers, some of them could be around 35,000 years old. Tattooed lines have a long history, albeit not as extensive. In 1991, a 5,000-year-old man’s frozen body was discovered on a mountain between Austria and Italy. In “The Tattoo History Source Book,” it has explained that his body—including knees, abdomen, and ankle—was adorned with lines, with the suggestion that they were applied for therapeutic reasons. Improving upon these primitive forms of expressions are printmaking, such as etchings and engravings, which use lines to give images depth and form. Through countless tiny marks, detailed pictures are composed. 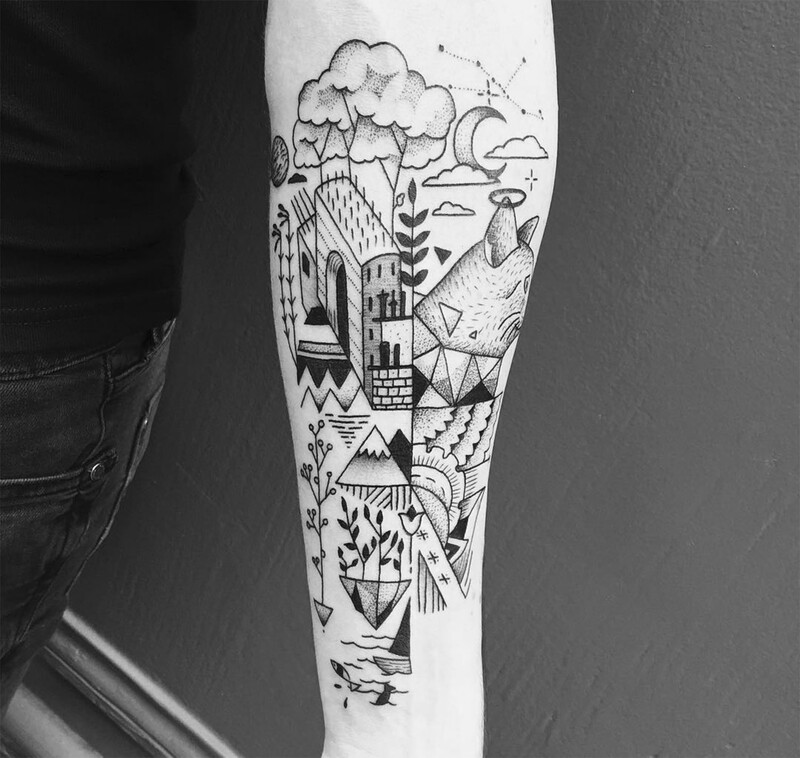 Like printmaking, linework-style tattoos utilize marks to create their imagery. 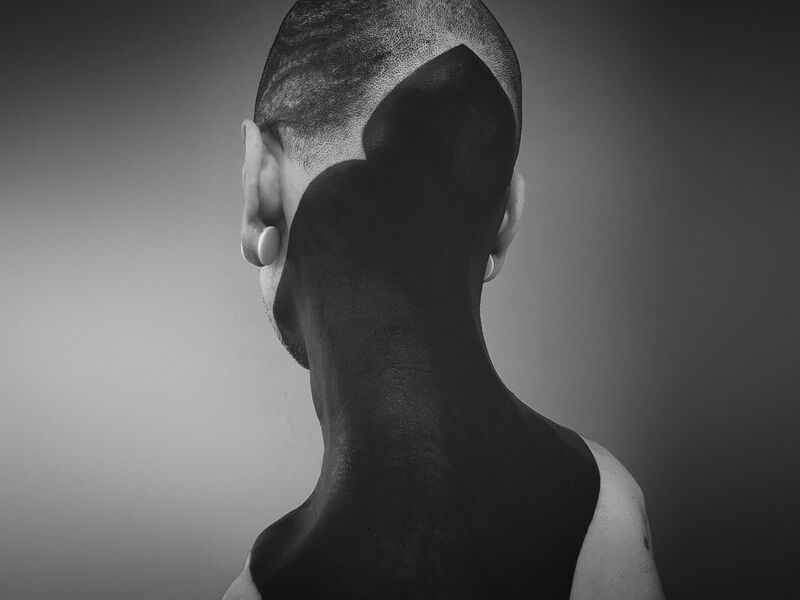 Shading is produced not with fields of pigment, but done in measured tics. Some are small and intricate while others are large and graceful. The style can vary greatly, but ultimately showcases the immense power that a line can have. 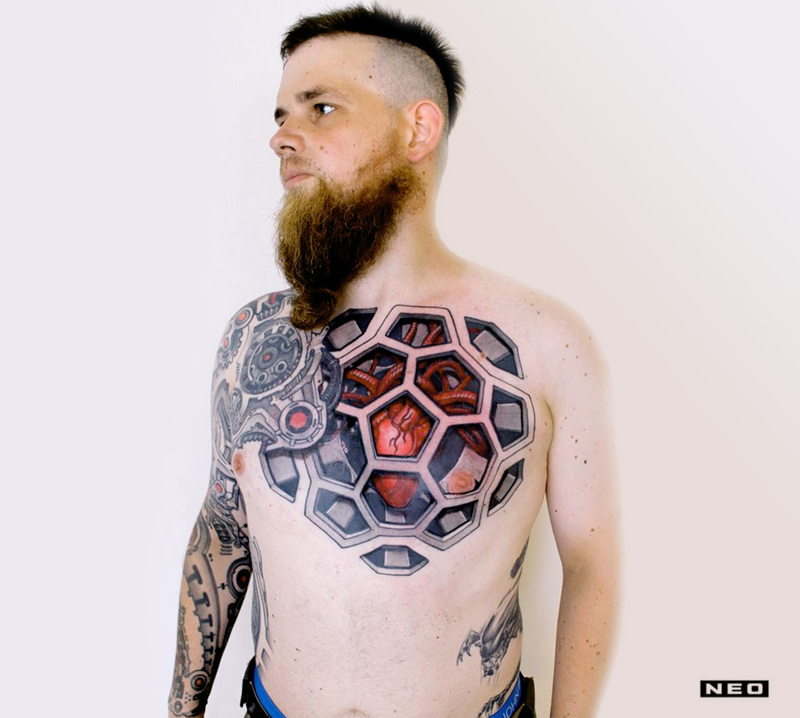 Chaim Machlev’s complex geometric tattoo are designed to flow with the body. 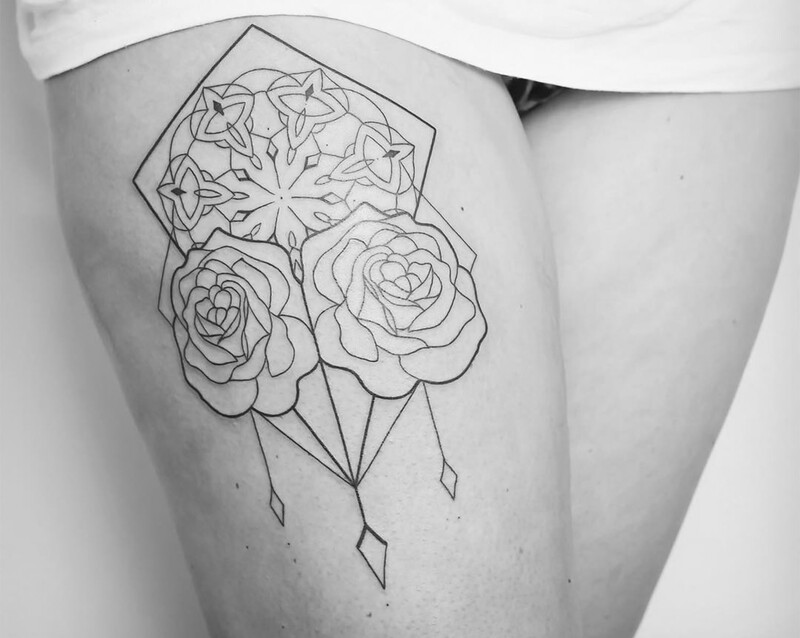 Geometric and organic elements flow into one graceful tattoo. 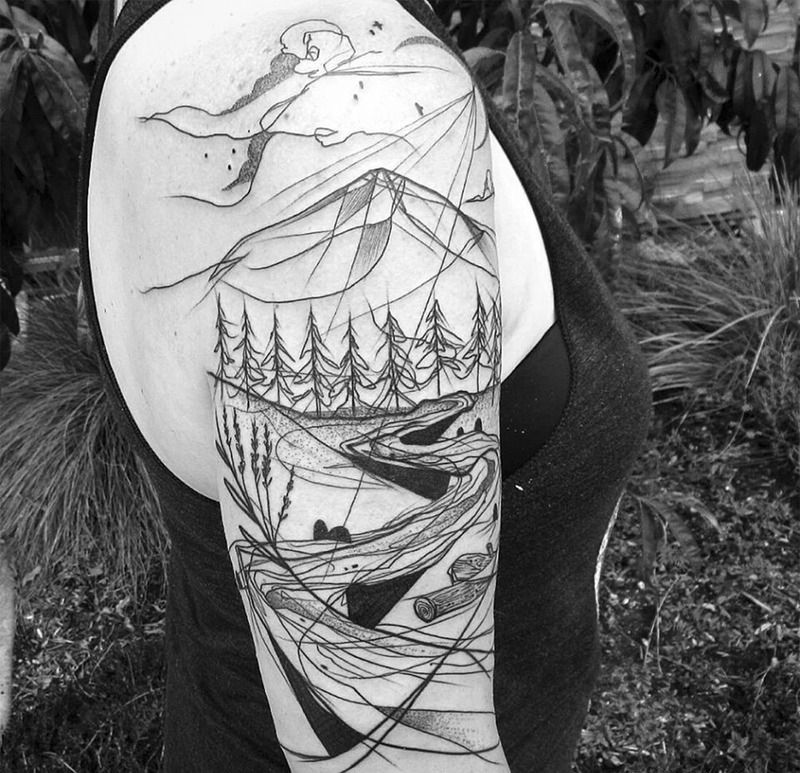 Katakankabin’s landscape-focused tattoos are inspired by her active lifestyle. 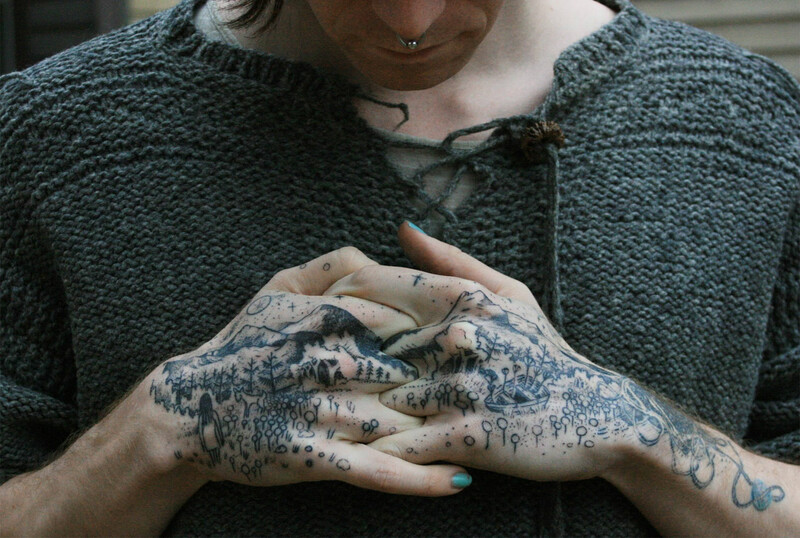 Nomadic artist Katakankabin has a vegan tattoo practice. 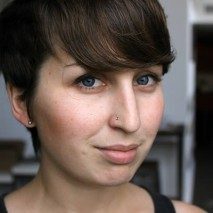 “I make my own vegan and organic vaseline,” she explains to TATTOOLOOK. 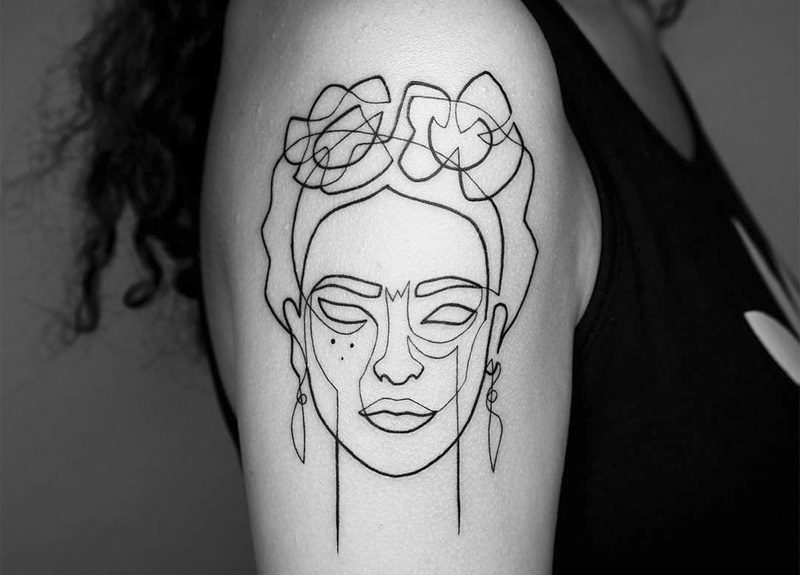 Continually trying to improve her formulas and technique, she uses hand-made Mexican machines, which is coincidentally where she first learned the art of tattooing. 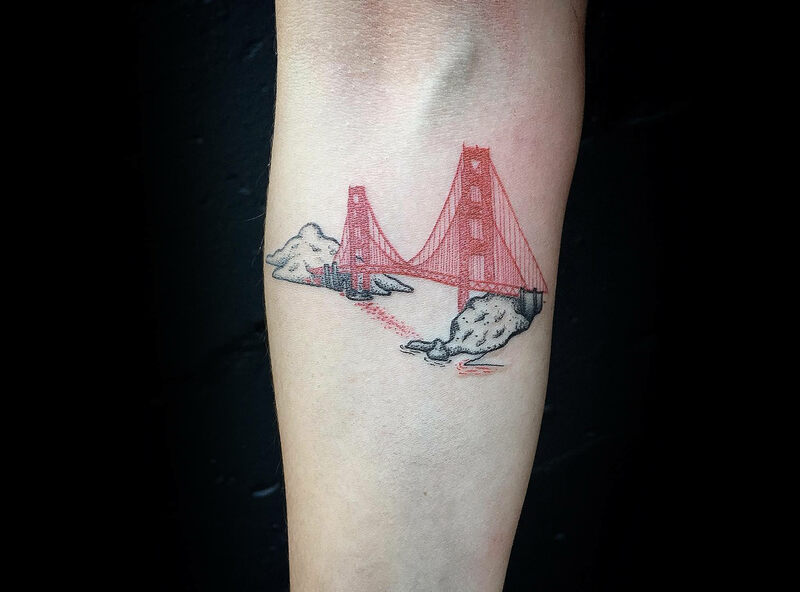 In addition to ink, Katakankabin calls herself “hyperactive” and enjoys riding bikes, long boarding, sailing, and hitchhiking—travel, essentially—that’s reflected in the subject matter of her tattoos. This tattoo has is reminiscent of a blind contour drawing exercise. Disparate elements come together to form an eye-pleasing composition. Salvador Dali’s portrait has a gestural feel—like it was ripped right out of a sketchbook. Nadi of Carpet Bombing Ink in Seoul, South Korea, has a rough aesthetic that includes paint-like ink splatters. This style, along with tattoos in general, is seen as taboo in the South Korean culture and something that Nadi is actively working to change. 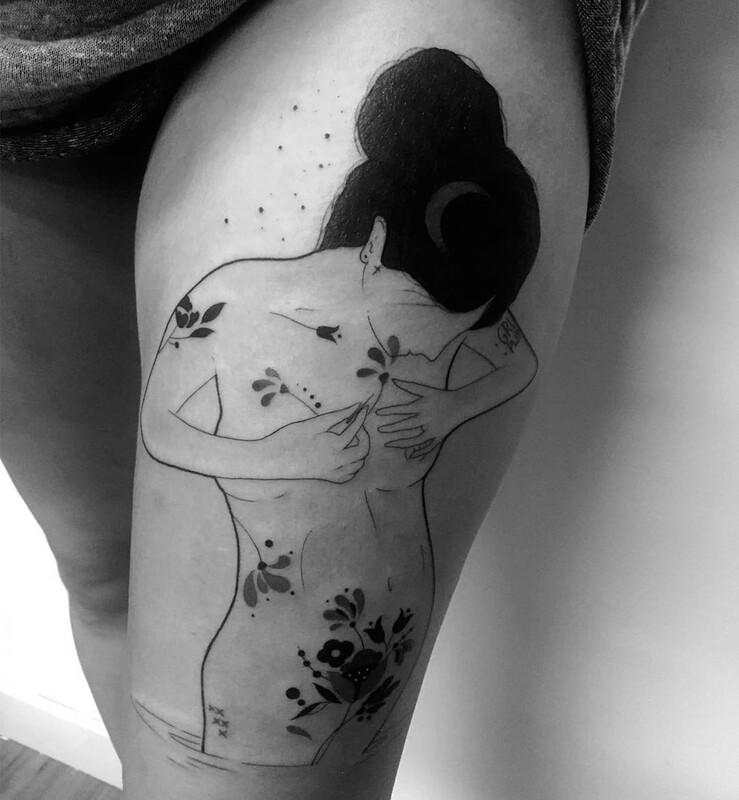 She familiarizes her young son with the practice by showing that it’s a celebratory act—when he was born, she and her partner Matz got matching tattoos. 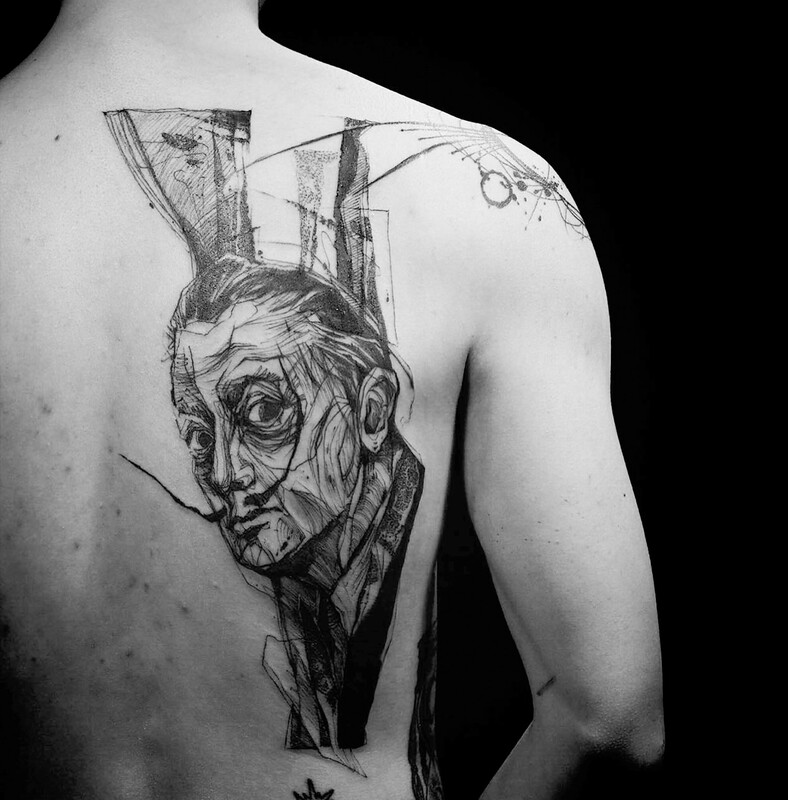 Dedicated prep work is how Chaim Machlev’s tattoos flow effortlessly across the the skin. 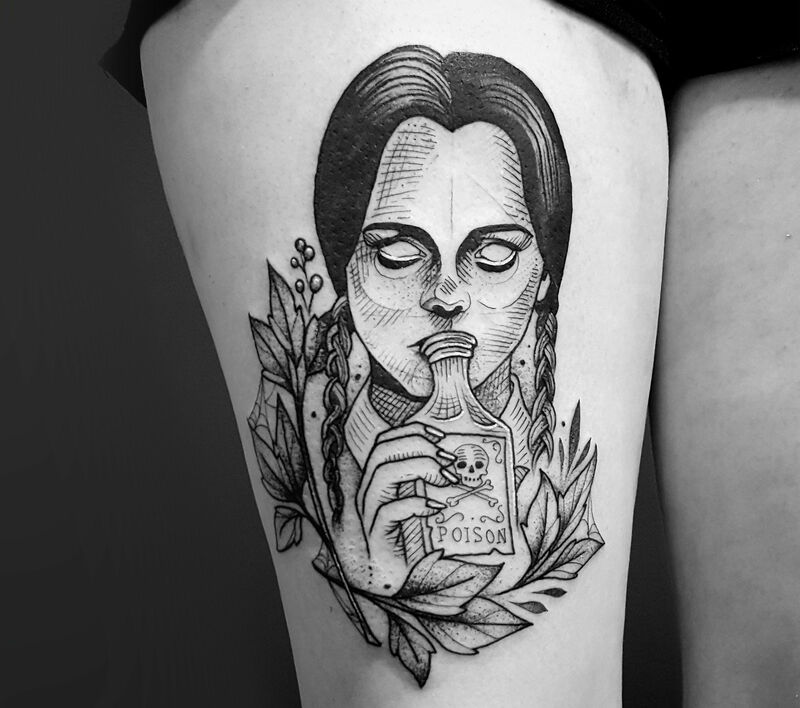 Bru Simões incorporates her tattoo imagery into other artistic formats. 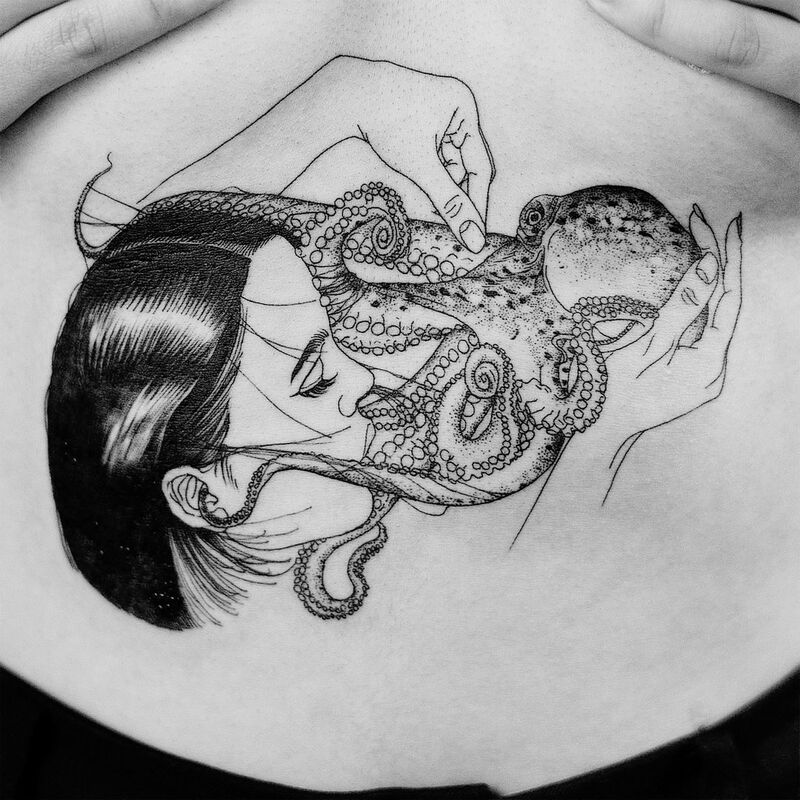 Since 2006, Bru Simões has tattooed her clients with strong-yet-delicate lines celebrating nature and the human body. One of her latest pieces features a woman embroidering her body with floral motifs. 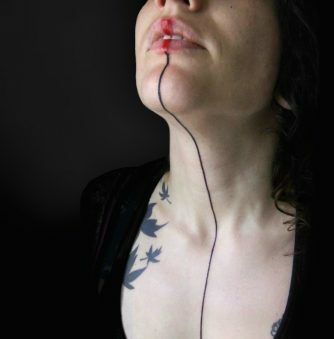 It’s a departure from Simões’ botanical pieces, but she writes, she’s “extremely happy with the unfolding of the work.” This same piece was translated in a few ways—on skin, on paper, and on fabric as hoop art. Pony Reinhardt fuses highly technical drawings with symbols of mysticism. 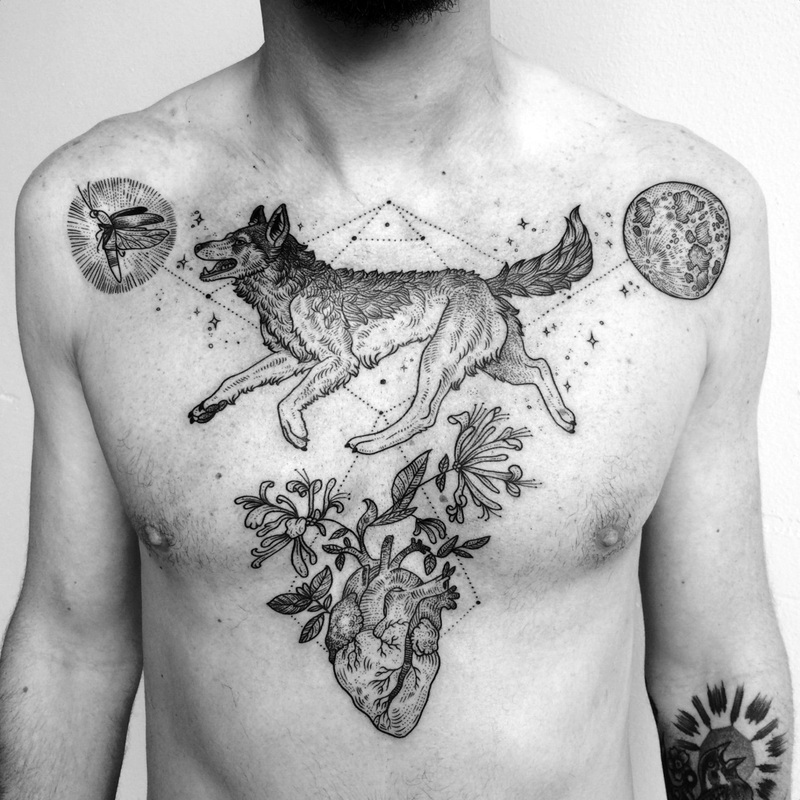 Following in the printmaking tradition is Pony Reinhardt, a tattoo artist at Tenderfoot Studio in Portland, Oregon. Part spiritual and part technical drawing, the highly-detailed pieces resemble engravings from master printers like Albrecht Dürer who gained popularity in the late 15th and early 16th centuries. Like Dürer’s work, Reinhardt’s tattoos rely on tiny lines to give their compositions a three-dimensional feel. 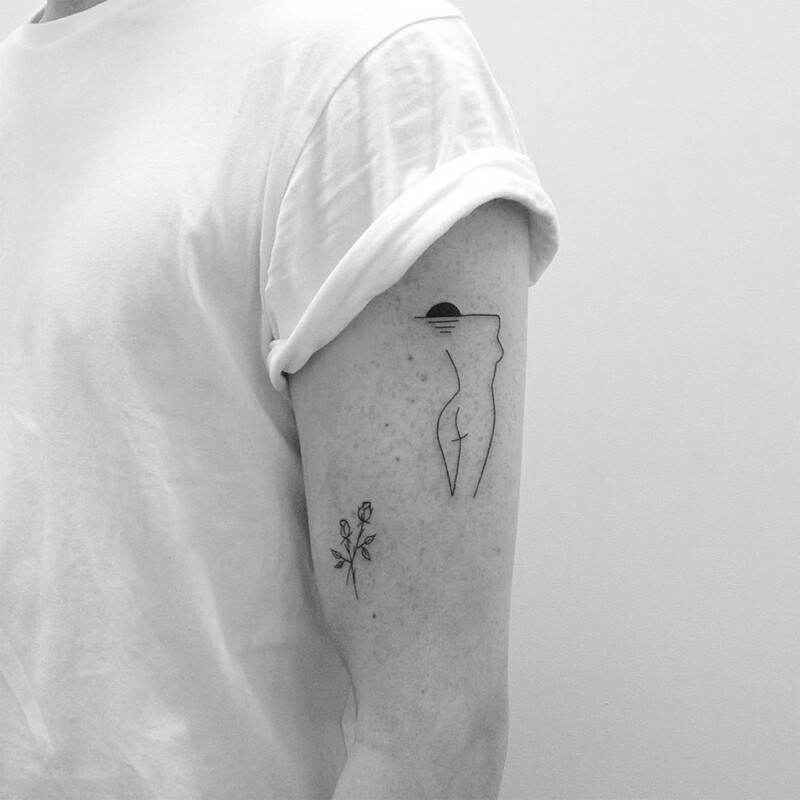 Art history takes a new form as a tattoo. 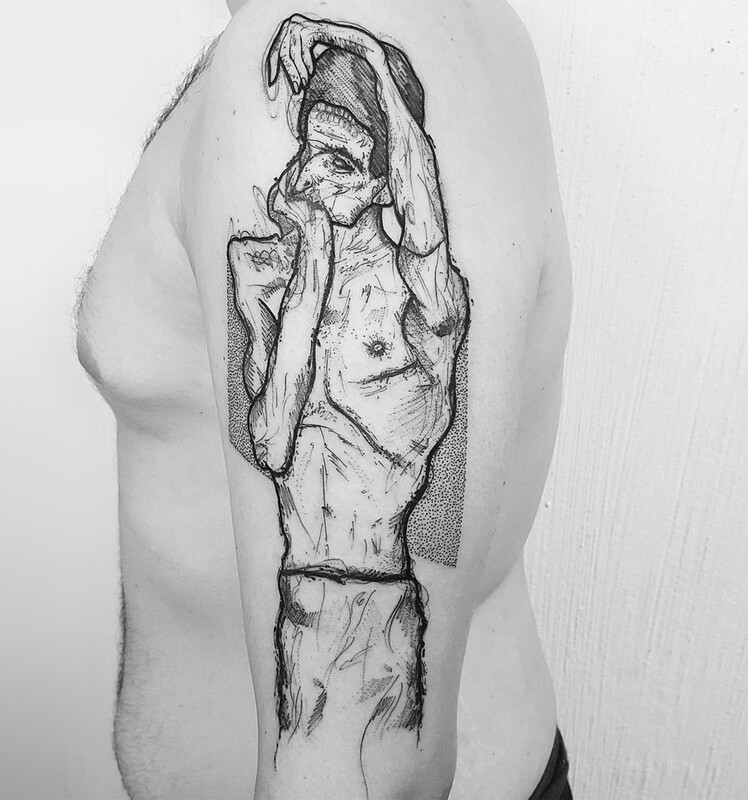 Matteo Nangeroni calls this massive arm tattoo a “reinterpretation” of Egon Schiele’s iconic gaunt figures. Although he has handled the piece with gestural, energetic lines, this represents only a facet of Nangeroni’s artistic style. 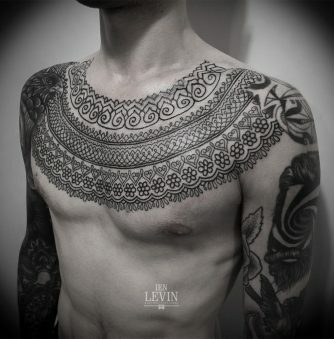 His other approaches include dotwork, blackwork, and surrealism, where people, places, and things fuse into one another and create a mashup of cultural and visual influences. 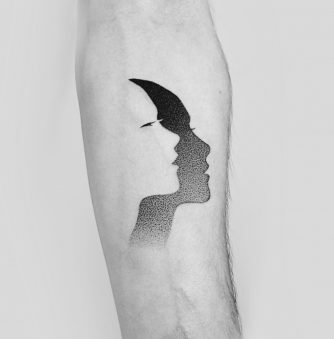 This tattoo fuses the beauty of a sunset with the human form, creating a seamless link between the two.